Goals from Jordan Henderson and Daniel Sturridge secured a 2-0 win for Liverpool as they easily handled Burnley at Anfield. Liverpool came into this game with a spring in their step after a strong run of results which culminated in a victory over Manchester City last Sunday, whilst Burnley searched for an unlikely away win to boost their survival hopes after an own goal saw them lose to Swansea at the weekend. The Reds were almost ahead inside 30 seconds as Sturridge capitalised on a one-two between Adam Lallana and Raheem Sterling, with only the reflexes of Burnley keeper Tom Heaton keeping the ball out. Liverpool continued to create chances with Henderson coming close off a rebound, and the away side were also trying to find a breakthrough, although their opportunities were less frequent and less imposing. In fact, much of the first half was more about Liverpool controlling the game but being unable to break down Burnley's defensive approach. But Kopites wouldn't have to wait that much longer for the opening goal: with a Philippe Coutinho effort blocked by Jason Shackell, the ball came to Henderson outside the box who pinged a sweet shot from the outside of his right foot directly into the net. Liverpool were 1-0 up, and Henderson had opened the scoring for the second consecutive match. Jordan's confidence continues to grow, and it can only benefit Liverpool; he has played a vital role in the side's revival over the last few months. Before half time, Coutinho and Sturridge had further chances, the latter once again being shut out by a superb Heaton stoppage. Burnley raised the hopes of their travelling fans when Danny Ings earned a free kick just outside the Liverpool penalty area, but they were unable to make the most of it. In the second half, Liverpool kept searching for a second goal to seal victory in a game that, admittedly, they were firmly in control of. 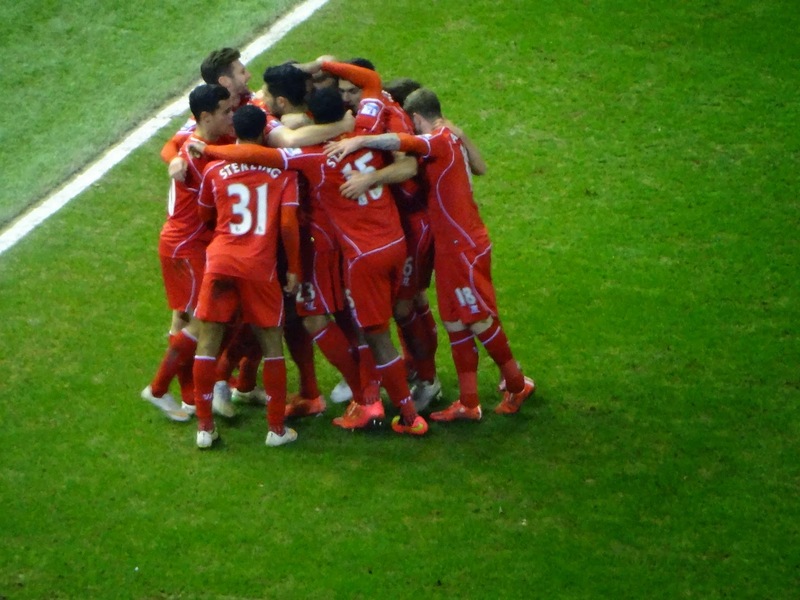 That all-important second goal came around 10 minutes into the second half, as a fine Henderson cross set up Sturridge for a rare headed goal (perhaps the unlikely nature of his strike explained the unexpected absence of his traditional dance celebration, opting for a general huddle with his colleagues instead). Not much happened in the rest of the half, bar some more chances for Liverpool by Lallana and Alberto Moreno. Burnley gave it their best shot but just didn't threaten Liverpool enough to cause any serious trouble. Given the ease at which the Reds were maintaining control of the match, it's hard to imagine that any spectators truly believed Liverpool would surrender their lead following the first goal, never mind the second. But that shouldn't discount what was a strong, unspectacular yet professional performance by the home side on the back of a major win over the defending champions three days earlier. So, the game went as the form book would have suggested. A fairly easy Liverpool win keeps the Reds firmly in the race for a top-four finish (the only disappointment for Liverpool is that all of their rivals for the European places won in midweek as well), although their attention now turns to a home tie in the FA Cup with Blackburn Rovers on Sunday, where victory takes them back to Wembley Stadium - or Anfield South, as long-time Kopites used to call it. Burnley were obviously less happy at how things transpired, but there was no lack of effort from the Clarets and it really couldn't have been a surprising result to them. Overall, a satisfying night to be a Red.